Fotomoto is a print-on-demand e-commerce widget that integrates seamlessly into your existing website. Just add our code to your site, sit back, and start making money. Fotomoto prints, packs, and ships orders to your customers, so you can relax and focus on your art. Fotomoto has something for everyone, from hobbyists to professionals and individuals to enterprises. Who else is using Fotomoto? Fotomoto makes it easy to sell your photos directly from your own website. All you have to do is choose what products to offer and how to price them. Quality Matters. We are obsessed with quality and only use the best print labs. We continuously test our partners' print quality, so you won't have to worry about it. Colorful Products. You can offer a variety of products in many shapes and sizes: Premium C-Print, Fine Art Giclé Canvas, & more - from 4"x6" to 40"x80", & panos up to 40"x240". Professional Packaging. We know art prints don't like to get rolled, that's why we offer flat packaging for prints as large as 30"x40". Your Business, Your Products. With Fotomoto, you choose how you want orders handled: we can do it for you, or if a customer wants a signed print, you can choose to do it yourself. Affordable High-Quality Prints. Fotomoto works with the best print labs and partners, offering a variety of product options to choose from. Sell A Few, Sell A Lot. The Fotomoto shopping widget lets your users buy images in any quantity. What's best, they do it right from your own site! Different Events, Different Settings. With Fotomoto's Collections you can create different settings for different events, controlling the products and pricing for each. Brand recognition. You can lightly customize the Fotomoto widget with your own logo to promote your services with our paid accounts. Your Website, Your Cart Fotomoto's shopping widget is completely customizable, so you can make it fit right into your website by controlling its looks. Generate Exposure. Fotomoto makes it easy for your visitors to share your photos on social networks or send them as eCards. Make Your Hobby Pay. Fotomoto turns your site into a photo boutique. Your admirer can buy your photos, so you can get that lens you've always wanted. It's Fun, and It's Free You don't have to pay to make your photos available for sale. We know the pleasure of making that first sale will motivate you to take your photography to the next level. "Fotomoto Takes the Pain Out of Selling Prints"
Before using Fotomoto, award-winning photographer Sam Javanrouh had to spend his time on printing, packing, and shipping all orders manually. Now Fotomoto takes care of all his orders, so he can focus his time on his photography & photoblog. "Selling Photos Were Never Easier"
When David Nightingale of the award-winning Chromasia looked at selling his artwork, he chose Fotomoto because of its easy integration and many personalization options. Fotomoto is the hassle-free way to sell your designs and illustrations from your existing website without having to worry about printing, packaging, or shipping. Beautiful Prints. Your designs and illustrations will look amazing on our heavy Fine Art papers, or high quality Canvas prints. More Print Options. Print the way you like; if our print network doesn't offer the quality/price you want, you can still use our product by fulfilling the order yourself. Different Collections, Different Settings. With Fotomoto's Collections you can create different product offerings and pricing for different groups of artwork. Your Website, Your Cart. Fotomoto's shopping widget is completely customizable, so you can make it fit right into your website by controlling its looks. See how Fotomoto helps John Conway sell his delightful digital art of the palaeo and neo varieties. Fantasy illustrator Aaron J. Riley uses Fotomoto to sell his illustrations from his existing website. Fotomoto lets you monetize your images while keeping your users on your own site. It is reliable, customizable, and easy to set up, no matter how large your site, library, or your audience is. Keep Visitors On Your Site. We bring e-commerce to your existing website, so your users don't leave your site to make a purchase. Reliable Service. 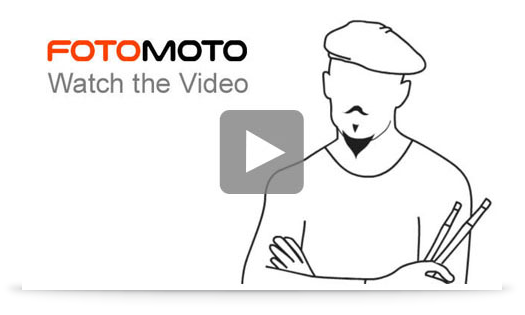 Fotomoto's patent-pending architecture means it is scalable and reliable, easily handling any traffic load. Advanced Accounting. Even if your images come from different agencies, we can handle the 3-way accounting for you. Fully Customizable. You can dress up the Fotomoto plugin via simple CSS controls to make it look and feel like your own website. Total Control. You have total control over what products you want to offer, and at what price, all easily set through our advanced & easy-to-use Dashboard. Fast & Lightweight. We know that when it comes to SEO & load speed, every millisecond matters. Our light-weight script is very lean & won't add to the page load speed. Rolling Stone Authentic has partnered with Fotomoto to offer high quality reprints of original Rolling Stone magazine covers. Browse, buy, and download historical photos from the U.S. Naval Institute's photo store with Fotomoto.